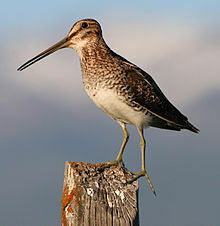 So, those birds that I thought were plovers are actually snipes, looking very much like the little fellow on the left. When I walk down the road that borders their nesting grounds, one or two will land in front of me and peep with distressed desperation to lead me away from their chicks. I was right about the ospreys. Yesterday I saw a couple diving for fish. One was successful but not the other. When they fly back with their catch, it’s always facing forward, looking like it has hitched a ride. 700+ words written yesterday. My tent mates and I all made a slow start, but today we’re determined to do better. For this project, my chapters are short — brief scenes presented in 2-4 pages. This makes the writing a bit like doing power laps: a spurt of effort, and then a short breather before the next one. Protagonist’s name is Calvin Callaghan Calhoun. Too much? He sounds like he comes from an old Southern family. Hmm. Not my intention, but it doesn’t hurt.